The SF Riva Manual shower is no longer available, a great new replacement is the Sonique Recessed Thermostatic Shower with Adjustable Riser or Sonique Exposed Thermostatic Shower with Adjustable Riser. The all new Sonique Recessed Thermostatic Shower with Adjustable Riser or Sonique Exposed Thermostatic Shower with Adjustable Riser. A perfect replacement for your old SF Riva Manual shower. 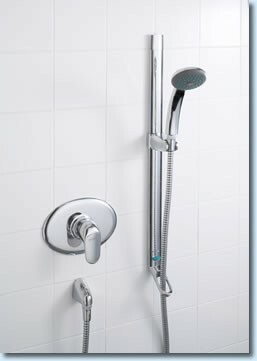 The Sonique showers come complete with a riser rail kit and stylish single function shower handset. IMPORTANT: Pipe centers for the old SF Riva were 110 - 116mm the new Capri pipe centers are 110 - 155mm.